Kawasaki’s Team Green program has consistently turned out some of this sport's best riders for over 25 years. In 1984, the program enrolled a young rider from Anaheim Hills, California, named Jeff Matiasevich. “Chicken,” as he was known, was a quick novice with a permanent smile in Southern California, and he was learning fast. By ‘85 he was one of the top intermediate riders in the country, winning big amateur races, including Ponca City and Loretta Lynn’s. Jeff was anxious to get to the pro ranks, and the following year, he hit the AMA supercross circuit as a Team Green support rider. His results were good enough to land him a factory Kawasaki ride in those pre-satellite-team years, and he would reward them with 125 West Region Supercross titles in 1988 and ‘89. 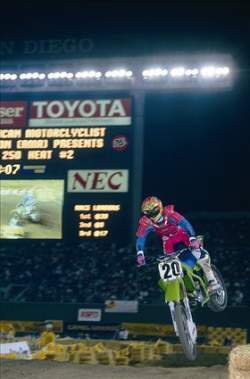 The following year, Matiasevich joined the 250 class for Team Kawasaki and was instantly competitive, winning the Las Vegas Supercross and then the ’91 Kenworthys 250 National. But most of ’91 and ’92 were difficult for Matiasevich as he struggled with bike setup and management. After up-and-down results during his stay with Kawasaki, he signed with Team Suzuki for the ‘93 season, hoping that a change of colors would restore his desire to ride and train. It wouldn’t, and Chicken was once again frustrated with his bikes. 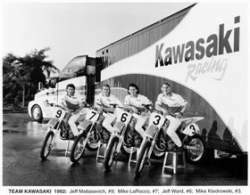 The 1992 Kawasaki team was one of the best of all time. How good? Matiasevich (#9) was the lowest number on the team! In 1994, with no factories calling, Jeff decided to do it his way. He got bikes through a local dealership, NCY. He employed his longtime friend Ron Heben to help him get his bikes and his program put together, and he hit the circuit as a privateer. At the end of that season, Kawasaki made him an offer he couldn’t refuse: They wanted to hire him to race the Japanese Nationals for Kawasaki of Japan. It wasn’t the U.S. series, but it was a significant amount of money for less than a dozen rounds, and Jeff agreed to the terms. He went on to dominate the Japanese motocross championships in ‘95, ‘96, and ‘97 before retiring in 1998. For the next few years, Jeff spent most of his time at home with his wife, Ruby, and their three children. “I really didn’t do much,” he laughs. “I was actually bored out my mind during that time!” So Jeff went to work for his father’s company, Vegland, in Fullerton, CA. The family-run company sells and distributes produce nationwide, and Jeff still works there today. While Jeff is currently separated from his wife, his three boys, Ryan, David, and Jacob, all have bikes and love to go riding with him. He has also dabbled a little here and there with AMA Supermoto. 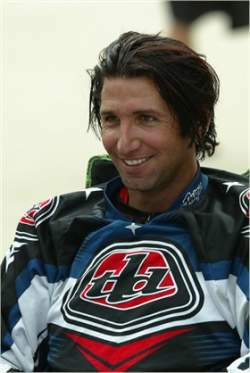 And when he does show up at Anaheim or Glen Helen or wherever to watch, Jeff Matiasevich is still almost always smiling.